If you’re new to WinDaq and attempting to acquire data at rates less than 1 sample per second, it’s easy to get confused. This is especially true using multiplexed data acquisition systems. Choosing a sample rate above 1 sample per second is pretty straight forward. Say you want to acquire two channels at 10 samples per second (S/s) per channel. With a multiplexed system, you would enter a sample rate of 20 (20/2). This is known as the throughput or total sample rate. When choosing a rate less than 1 S/s, however, the rate is expressed as a decimal number. Here’s where things get tricky. Say you want to sample 2 channels, once every 5 minutes. WinDaq doesn’t allow you to enter a sample interval in minutes, so you’ll begin by calculating the number of seconds (300 in this case). Next you’ll take the reciprocal (1/x) of 300. This yields a sample rate of 0.0033. But were not finished! Once again, since there are two channels enabled, you’ll need to multiply by 2, which gives you a throughput sample rate of 0.0066, or 1 sample every 300 seconds, per channel. This is the number that you’ll enter in the Sample Rate dialog box (Edit>>Sample Rate). 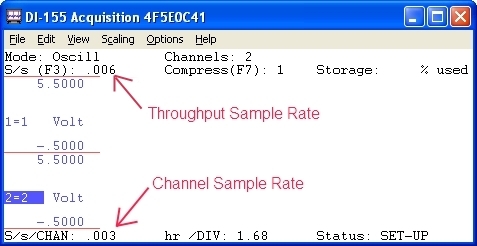 WinDaq displays both the throughput sample rate and the channel sample rate. Note that the WinDaq window appears to be frozen, with no data cursor or grid lines when a slow sample rate is chosen. In reality, there simply isn’t any data to display! If you’re acquiring a sample every 5 minutes, it’ll take that long for WinDaq to plot the first data point, another 5 minutes to plot the second data point, and so on. 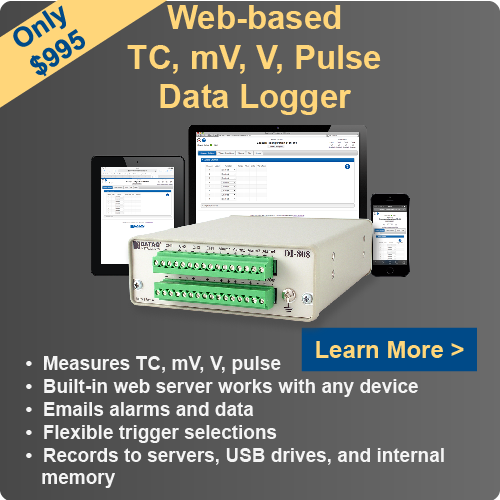 Hopefully this helps clear up the confusion of sampling at rates less than 1 S/s using WinDaq Data Acquisition Software. If you still have questions, visit our support portal at https://help.dataq.com/portal/home.